The War of the Ring is book VIII in the twelve-volume History of Middle Earth series by JRR Tolkien, edited by Christopher Tolkien. It is also the third of four books known as The History of the Lord of the Rings, comprised of the early drafts of The Lord the Rings and commentary by the editor. The first two books in this sequence, The Return of the Shadow and The Treason of Isengard, brought the narrative of The Lord of the Rings up to approximately mid-way through Book III, when Gandalf and Co. reach Edoras and confront King Theoden and Grima Wormtongue. The chapter known as “The King of the Golden Hall” in LotR. The author had thus far only followed the remnants of the ‘Fellowship’ to the west, and had not undertaken any part of Frodo and Sam’s trek towards Mordor. The road to reach this point had been anything but smooth. The story was already nearly five years in the making. The stretch of writing constituting much of Book III (beginning with “The Departure of Boromir” and ending with Theoden’s departure from Harrowdale) was completed near the end of 1942. Tolkien’s first drafts had begun as early as December 1937. The books constituting what would later become The Fellowship of the Ringhad been written and rewritten (and in many cases rewritten several more times) as the story outgrew its original conceptions. was an extremely complex process” (WotR pg 3). 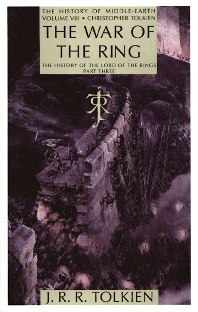 Due to a complex chronology between one set of characters (Gandalf, Aragorn and Co.) and another (Merry, Pippen, and Treebeard), Tolkien allowed the conflict between Rohan and Isengard to evolve as a whole rather than on a chronological chapter-by-chapter basis, moving forwards and backwards through the narrative. After finishing the remainder of what would become Book III, Tolkien allowed the story to rest for over a year, returning to the tale in early 1944 to tackle the journey of Frodo and Sam to Mordor. Gollum enters the tale for the first time, and is captured by the hobbits. The narrative progresses straightforwardly through Book IV, in many places coming quite close to the final draft that appears in The Two Towers, through the dead marshes, Ithilien, and into “Kirith Ungol” (as it was originally spelled). The third section of The War of the Ring addresses the sequence of events that comprise Book V, concerning the preparations for war in Minas Tirith, the muster of Rohan, the siege of Gondor, the Battle of the Pelannor Fields, and the travel of the remnants of the Gondorrian/Rohirric army to the Black Gate. This section, like Book IV, remains fairly consistent (in general plot sequence) to the published novel, in spite of some fairly hefty revisions in chronology and dialogue. This takes us very neatly to the end of Book V in the published text, and leaves only the trek of Frodo and Sam from Minas Morgul to Orodruin (Mt. Doom), the crowning of the King, and the denoument, consisting of “The Scouring of the Shire” and the departing of the company from the Grey Havens to be addressed in book IX, Sauron Defeated. Like the books before it, The War of the Ring takes its name from that originally proposed (and discarded) by JRR Tolkien to the publishers as a title for Book V.